Pre owned cars are generally a less expensive option than buying a new ride off the showroom floor. In some cases, however, the previous owner was a character in a blockbuster movie, and in other cases, the car itself was a character in the movie. In that case, people are willing to shell out hefty amounts of money to own these pieces of cinematic history. 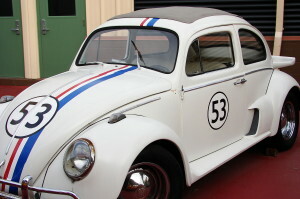 Herbie the Love Bug was actually a few different cars featured in six movies. The first film, 1968’s “The Love Bug” was a smash hit, grossing over $50 million on a budget of just under $5 million. In the early and mid-1960s, America was in love with the Beetle, an inexpensive and fuel-efficient German import. So, when they made a movie about one with the soul of a person, people immediately expanded their infatuation. In the first film, the anthropomorphic automobile helps a down-on-his-luck race car driver turn his life around and find love, all while delivering big laughs. Recently, the original Love Bug sold at auction for $125,000 to a collector who had grown up loving the little car with the big heart. David Hasselhoff may be better known for Baywatch these days, but it was the show Knightrider that propelled him to stardom. From 1982 to 1986, the Hoff played Michael Knight, an LAPD officer recruited to fight crime from behind the wheel of a special high tech ride. 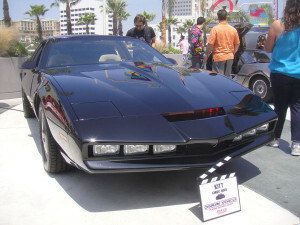 That car, the co-star of the series, was KITT (Knight Industries Two Thousand). KITT was a car loaded with high tech gadgets and equipped with an artificial intelligence computer. KITT was voiced by William Daniels, whom readers may remember as George Feeny from Boy Meets World. Together, KITT and Michael drove around fighting crime in Southern California. In July of 2015, nearly 30 years after KITT’s last bust, a collector paid over $300,000 for it at an auction. Like some pre owned cars, this one didn’t come with all the original features, no computer voice included. The General Lee is a genuine piece of American history. From 1979 to 1986, it flashed bright orange American muscle on prime time network television, helping Bo and Luke Duke evade their trouble with the law down in Hazard County, Georgia. 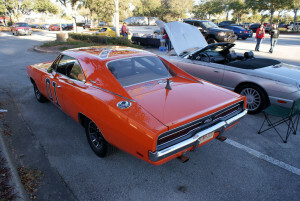 The 1969 Charger was named after General Robert E. Lee, commander of the Confederacy. It sported a hard top emblazoned with the Confederate flag in an era that was slightly less politically correct than the present. Being such an emblem of the south, it was no surprise when one of the original, on-screen automobiles was sold to golfer Bubba Watson, a proud native son of the Florida panhandle. Watson drew the ire of many die-hards when, in the wake of controversy over the confederate symbol, he painted the American flag on top to replace the old stars-and-bars. But if you’re willing to fork over $120,000 for a car, you should probably be allowed to do whatever you want with it. These pre owned cars are more expensive than most new luxury cars. If you’re a collector, though, it’s totally worth it! To learn more about their options for pre owned cars, Harrisburg, PA residents should visit http://www.certifiedpreownedofhershey.com/. Part of the reason Classic Cars Online US exists is to help connect classic car buyers and sellers, and we’ve added several ways for you to connect, but first, be sure to visit the Classifieds page if you’re in the market to buy or sell classic star cars.